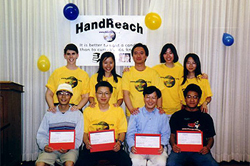 HandReach was founded in 2002 by a small group of graduate students in Communication at the University of Maryland. Despite limited resources, these students wanted to use what they had to facilitate meaningful educational projects in China's poorest rural schools. HandReach thus began by offering microgrants to applicants with strong project ideas who were willing to commit to full transparency and accountability in their use of funds. To date, HandReach's microgrants have accomplished over 50 educational development projects around China. In 2006, HandReach director Brecken Chinn Swartz encountered a young girl with severe burn injuries begging for help on the streets of Beijing, and through the process of obtaining reconstructive care to help the girl achieve her dream of walking again, Dr. Swartz realized the tremendous gap that exists for poor children throughout the developing world debilitated by complex trauma injuries whose families cannot afford much-needed care. Responding to this need, HandReach launched the Children's Healing Initiative (CHI) in 2007 to bring together the best hands in the world to help children left disabled by burns and amputations recover and get back to a full, productive life. In May 2008, HandReach extended its reach by responding to the massive earthquake in Sichuan Province that left thousands of children without limbs by launching the Sichuan Hope Project in partnership with 512Children.org.In addition to responding the needs of injured children, the HandReach Board of Directors also wanted to assist in the reconstruction of a school in a very remote area that had been devastated by the earthquake and was outside of formal earthquake relief efforts.. 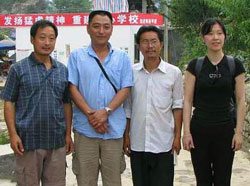 In July 2008, HandReach's Project Coordinator in Chengdu, Mr. Ouyang Xiaodong, was accompanied by HandReach Board member, Luo Yi, to personally deliver school supplies to the school at Guanzhuan Town, Qingchuan County. Thanks to generous support from HandReach donors, the school is now functioning again after the Sichuan Earthquake. HandReach's vision is that no child injured by trauma anywhere in the world will be left without resources to recover, obtain a full education, and lead a productive, healthy life.